You’re about to learn 34 extreme adjectives in English. For more adjectives, check out 72 Appearance Adjectives You Need to Describe People in English. Sometimes normal adjectives aren’t strong enough to express what we want to say. But that’s OK. In English, there are lots of strong adjectives. Extreme adjectives are really useful when you want to say that something is very, very, very good. Or when someone is very, very, very angry. 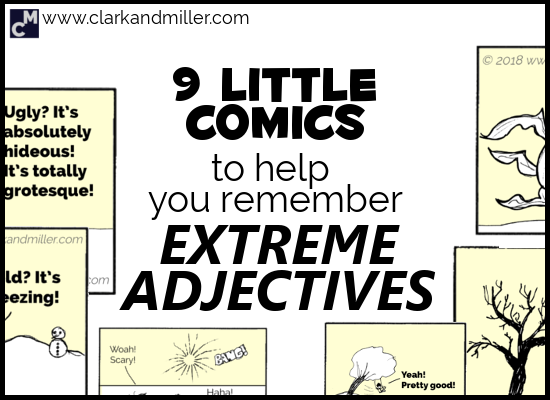 Here are nine little comics to help you remember some of the most common extreme adjectives. Yes! You made it to the end! So there were quite a lot of extreme adjectives there. The trick is to try and use them. So let’s do that! What’s the most hideous part of your town? Why is it so ugly? Do you know any hilarious jokes? These comics are marvellous and captivating! Thank you! Still, I have a question – why do you use “strong adjectives” and “extreme adjectives”? What’s the difference? Thanks for the positive feedback, Melita. I’m glad you enjoyed them. Hi Gabriel. The most hideous part of my town is the historic center. A degraded part that needs to be refurbished but there’re always political problems. That’s interesting. Where do you live by the way? Yes.I’d like this lesson.Thank you. Sir, your lessons are right up my alley. Could you make a lesson connected with using linked words (phrases) such as according to, in addition to, as regards, by the same token and so on and so forth, please? Because all too often these phrases are being used by well-educated persons in formal speech and it makes me feel confused a little bit. A little piece of suggestion ,could you please make all your blog lessons into PDF format? That way ,we can download them and read them anytime by our cell phones .THX a million ! Thanks for the suggestion (and for the awesome compliments). It’s a good idea and I’ll definitely see if it’s feasible. Really impressive ! I have learnt a lot .